It is important to ensure the correct procedure of the electrocardiogram (EKG) in order to avoid errors that may make its interpretation difficult. Inform your patient about the test and the risks involved. Ask your patient to remove electrical equipment such as mobile phones or watches that may interfere with the signal when performing the electrocardiogram. The patient must also remove metallic objects, such as chains or bracelets, from the EKG electrode area. Ask your patient to undress from the waist up and expose their ankles, in order to place correctly the electrocardiogram electrodes. Always ensure your patient’s modesty is not compromised by covering their torso with a bed sheet, particularly with women. Make the patient lay down in the supine position on a stretcher near the electrocardiograph. Clean and disinfect with an alcohol solution those areas in which electrocardiogram electrodes are to be placed to ensure good attachment to the skin and a better EKG signal. Place the EKG electrodes on the thorax, wrists and ankles. It is important to rigorously place the electrodes to ensure a correct reading of the electrocardiogram. Advise your patient not to move nor speak, and to breath normally as the EKG is being carried out. Check the electrocardiogram before removing the electrodes. Make sure every lead is well seen and that there are not many artefacts present. If in doubt, consult a doctor. Repeat the EKG procedure, if necessary. Important: Always label the EKG tracing with the patient’s full name, time and date. 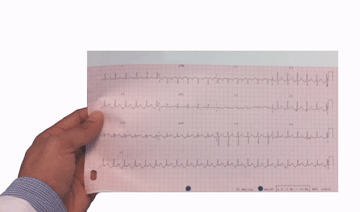 In the next section we will further explain electrocardiogram paper. Click on Next down below to stay with us.